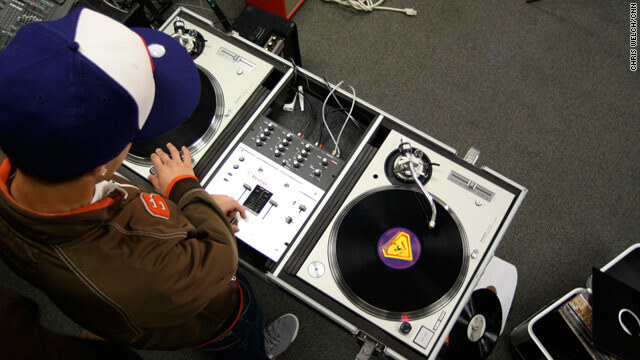 Students at McNally Smiith College of Music can study DJ techniques. St. Paul, Minnesota (CNN) -- When you're on a college campus and you ask someone what they're studying, one answer you don't typically hear is "hip hop." But McNally Smith College of Music in St. Paul, Minnsota, is the first school in the nation to offer an accredited diploma program on the study and performance of hip hop music. For Austen Huls, it is one of the primary reasons he's pursuing secondary education at all. His first attempt at community college, taking general education courses, didn't work out so well. "I pretty much bombed my math class right out of the shoot," 19-year-old Huls said. "Then I realized I need to go to school for something that I enjoy, or at least pursue something that I enjoy, so I'm not miserable." Playing drums gives him more pleasure than anything. But for a long time, he'd considered music school taboo. "[I thought to myself] 'a lot of musicians don't go that route,' " Huls said. "But then I grew up in my head a little bit and I just said maybe I'll try it." Huls discovered McNally Smith and its three-semester hip hop diploma program. His ultimate goal is to be a big-time drummer like Travis Barker of Blink-182. "When I was 14, [my brother] took me to a Blink-182 concert in Minneapolis at the Target Center. I was watching Travis Barker play the drums, and his drum set sunk into the stage, went underground, and he went into the crowd and started going nuts for the crowd." "That is what I want to do, and there's no doubt in my mind." His plan is to complete the diploma track and then consider a full degree in percussion performance. "When I'm sitting at home, I just go up, close my eyes and play music. It comes to me. So, like if I were to do it for a job, it wouldn't feel like work, and I could be having fun making my own money." But hip hop is not a genre without its critics. This is a very important art form that is not going away. "There are people who might say, 'If you have hip hop in a college, isn't that almost a contradiction in terms?" said McNally Smith College President Harry Chalmiers. "'It's a street music, it grew up in the neighborhoods, how can you have it in the college?'" "This is a very important art form that is not going away," Chalmiers tells the genre's opponents. "When we look at hip hop closely, we see that we can study its impact on people's lives, on society. Where does this music come from? When it's angry, when it's sometimes vicious, vile or rude, why is that? What are people trying to say? These are important questions to ask." Kevin Washington, a drums and rhythm instructor on the hip hop faculty, says that the birth of hip hop resembles that of jazz music and the time is right for hip hop to be treated as such in the schools. "Jazz started like hip hop -- out of the urban neighborhoods, black neighborhoods. There was a language, there was clothing, there was a style that everybody started copying. So when they started putting jazz in schools, there was controversy at first," Washington said. "I felt that we were in the same situation with that." In the six weeks the program has been underway, there has been no sign of a collective protest. One reason could be that the curriculum is part hands-on and part textbook learning, as well. Instructors include various Twin Cities-based hip hop artists such as Toki Wright, the program's coordinator who's touring at venues across the country. More internationally known names are instructors as well. For example, DJ instructor Freddy Fresh had Top 40 hits in the United Kingdom and has also performed with industry figure Fatboy Slim. Founded in 1985, the school is accredited by the National Association of Schools of Music. According to the school's Web site, it has a yearly average of 600 students enrolled who are taught by the 100-member faculty. And to those who are surprised at the geographic locale of the first hip hop program, the Minneapolis-St. Paul area just might have more to offer than you think. "It's funny -- here we are in the upper Midwest, where people might think, 'Oh my gosh, it's a backwater, you're not New York, you're not Los Angeles,' " Chalmiers said. "The Twin Cities has a really rich musical community that goes from the best chamber orchestra in the world to some of the most unique rap music collectives you'd ever want to find. So this is a great place to do it."